Scentsy Sugared 🍓 Strawberry Wax Bar – Fusing homegrown goodness with pick-’n-eat fun, Sugared Strawberry blends fresh luscious strawberries, juicy currants and California sun-kissed lemons. 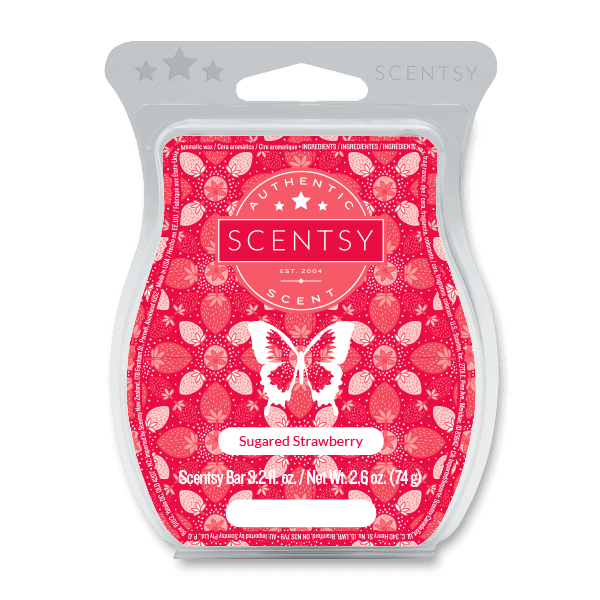 Sugared Strawberries scents is Made of high-quality paraffin wax for long-lasting fragrance, Scentsy Bars are composed of eight break-apart cubes designed to use with any Scentsy Warmer. As the cubes melt, they fill your space with our exclusive scents, inspiring imagination and memories. Safe to use — no wick, flame, smoke or soot. Made in Idaho, USA. Net wt 2.6 oz.